The city bike tour is a 2-hour bike tour of Santa Barbara. Your guide will have a handful of great bike routes, intriguing stops, and fun facts to share with you along the bike paths. 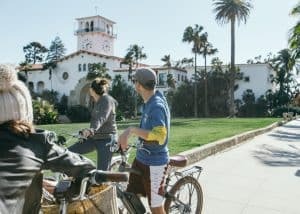 This bike tour will bring you into beach-side views, popular parts of town, around historical locations, and many more stops unique to Santa Barbara! It's private so you pick the pace of the tour! 2 hours of a great time! 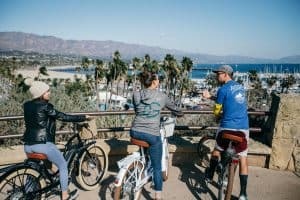 The electric bike tour is a 2.5 - 3 hour bike tour of Santa Barbara. The electric bike tour is like an upgraded city bike tour. With your bike providing electric assist your guide will be able to show you spots you wouldn't normally see on an average tour in town. Be ready to see some beautiful sights off the beaten path with great views for picture perfect moments! 2.5-3 hours of a great time! "So glad we did this for the short time we had in Santa Barbara. Our guide gave us a great overview of the city, was friendly, and shared local tips on where to eat, drink, and what to see for the time we had"